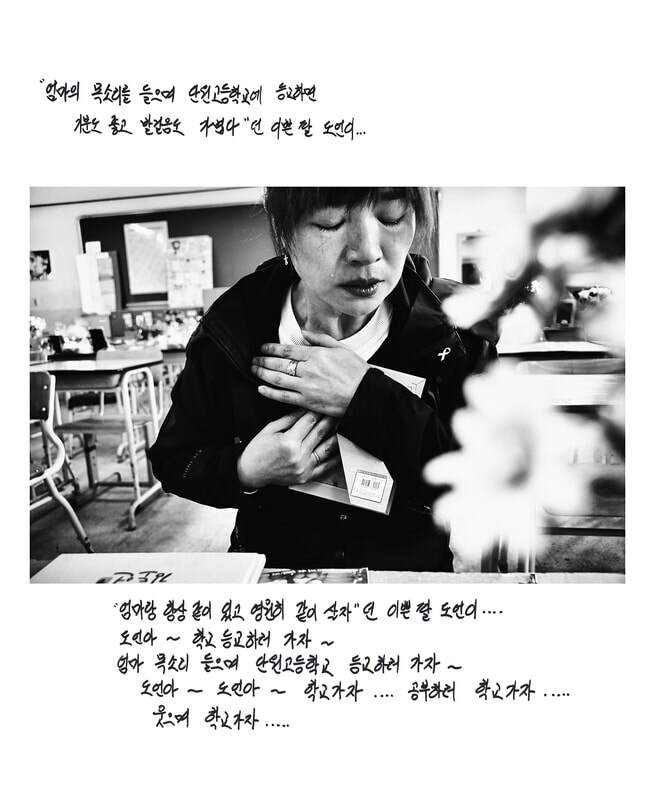 Ten classrooms at Danwon High School were transformed into memorial sites during the Sewol Ferry Tragedy on April 16, 2014, when the lives of 250 students and 12 teachers (nearly its entire second year class) were lost off the coast of Donggeochado, South Korea. Overnight these classrooms were covered in their own sea of photographs and personal letters addressed to the departed. From this origin of loss, these classrooms emerged as sacred spaces, repositories of memory. Amidst debate of what should be done to preserve the memorials, a controversial attempt to forcibly clear out and remodel the classrooms was made almost immediately after the 2nd year anniversary of the tragedy. For several days family members occupied the school grounds until an extension was granted to access the classrooms for a few more weekends. In August of 2016, the school resumed renovations and removal of all memorial items. Powerless against the forces that be, these families say they’re losing their children and loved ones for a second time. In 2010, I entered public school teaching through the Gyeonggi English Program in Korea. 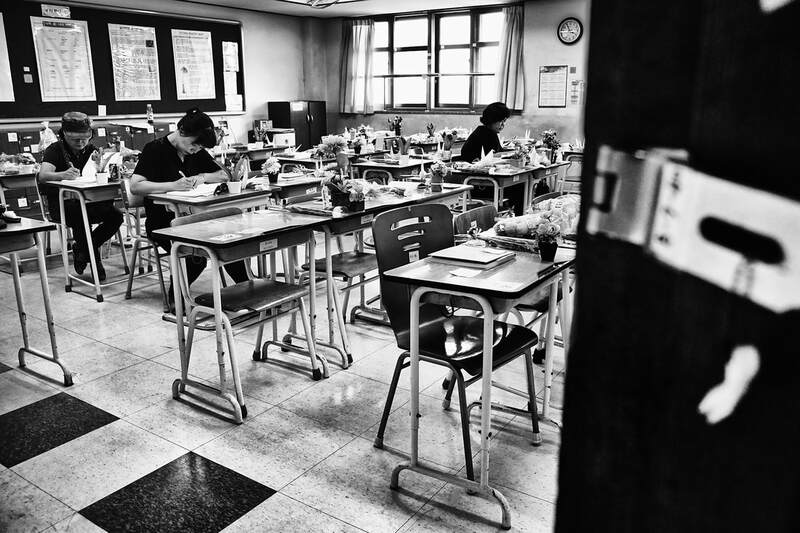 GEPIK serves the Ansan area, placing educators in Danwon High School. Because of this connection, it was easy for me to imagine the children as middle school students I had once taught. I felt compelled to help preserve the space. When government and school officials made it clear that this would be impossible, I re-focused my efforts to photograph the significance of the memorial's removal. Dismayed that my initial essay hadn’t generated the awareness I had wished, I sought to assist the families further. Approximately a year later, I returned and provided them my photographs to record their thoughts. This renewed document is a collaborative effort, one that shares personal insights from individual family members to create a portrait of the community’s voice as a whole. 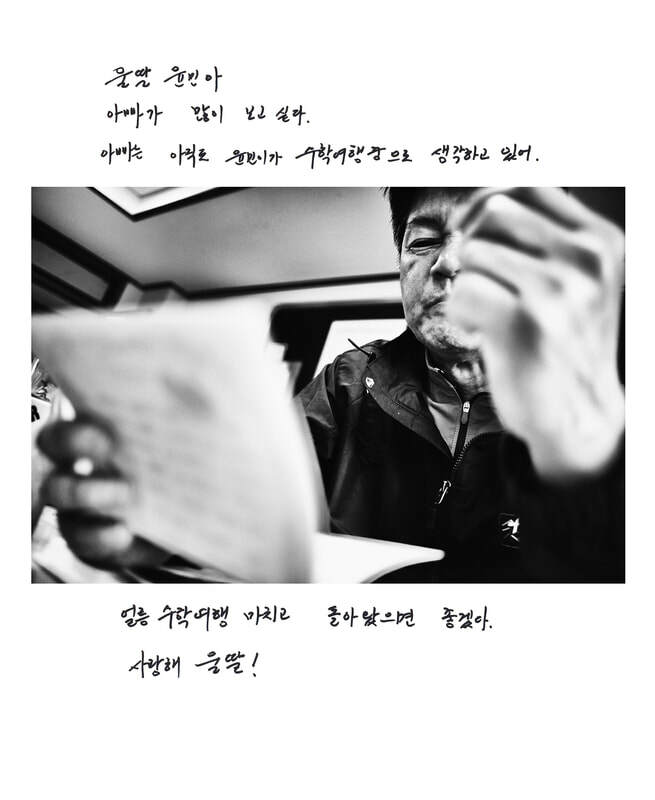 Im Young-ae writes to her son, Oh Jun-young. His body returned home on what would have been his 18th birthday. Lee Ji-sung presses tight a photo of her daughter, Kim Do-eun, while sitting at her classroom desk in room 2-3. 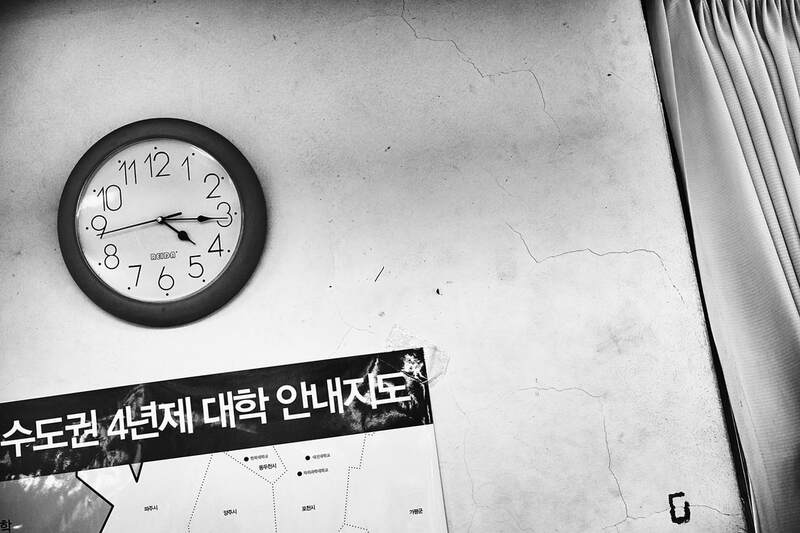 Clocks in many of the memorial classrooms were set to 4:16 in reference to April 16th, the date of the Sewol Ferry sinking. I miss you so much and I am picturing you in my heart. 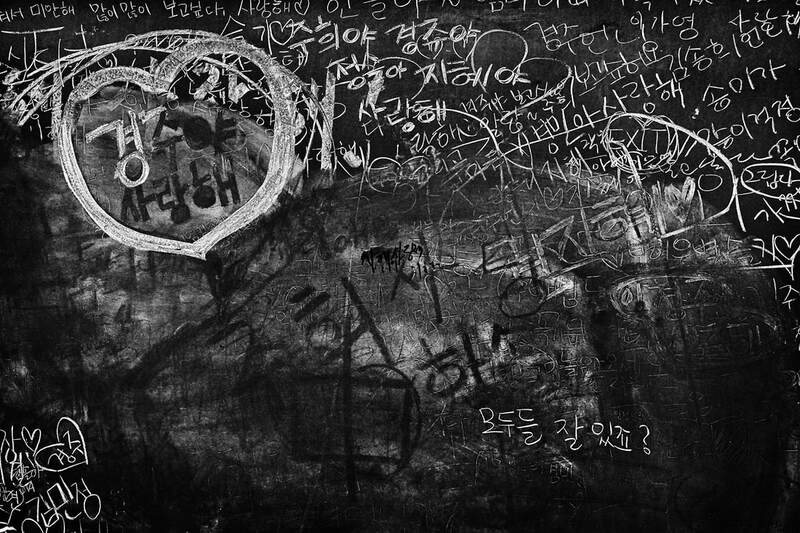 Seong-ho, I’m having a hard time because you are not here. I promise to live my life to the fullest for you. 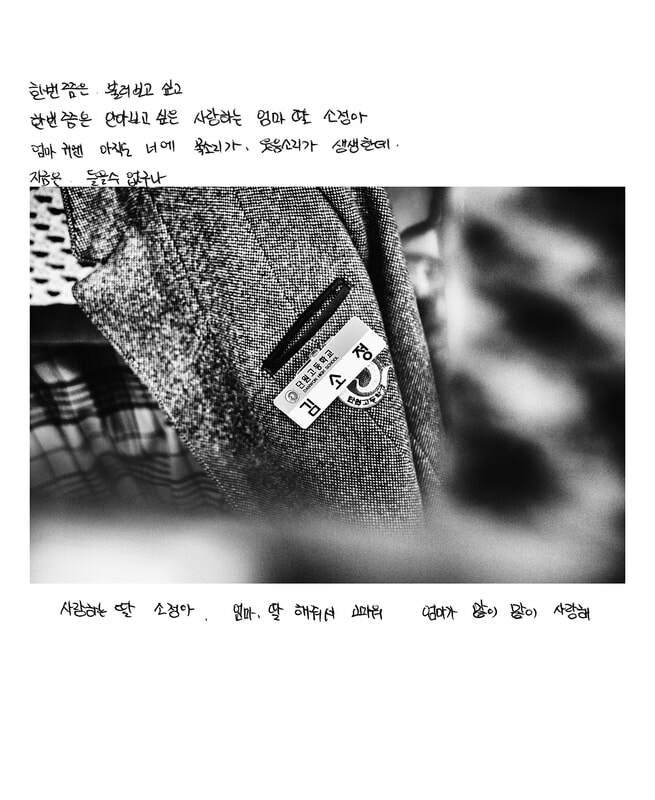 Park Ye-na holds her brother Seong-ho’s Danwon High School identification card. The reason death is horrible is because you never know when it may strike. For someone like me, someone who wasn’t able to express love until it was too late, death fills you with regret. I hope you won’t let that happen in your life. Another reason death is awful is that it makes us forget. I feel like I’m falling deep into the ground when I think I can’t remember Yeong-man’s face anymore. It’s better when I cry my eyes out. Please don't forget about the precious lives that were lost during this tragedy, especially if you have a sense of sympathy for the wrongful deaths of 304 people and the issues that allowed it to happen. To my beloved daughter, So-jung, who I wish I could call out to and hold once more. Your voice and laughter still linger in my ears vividly. But in reality, nothing is there. My loving So-jung. Thanks for being my daughter. Mom loves you so much. 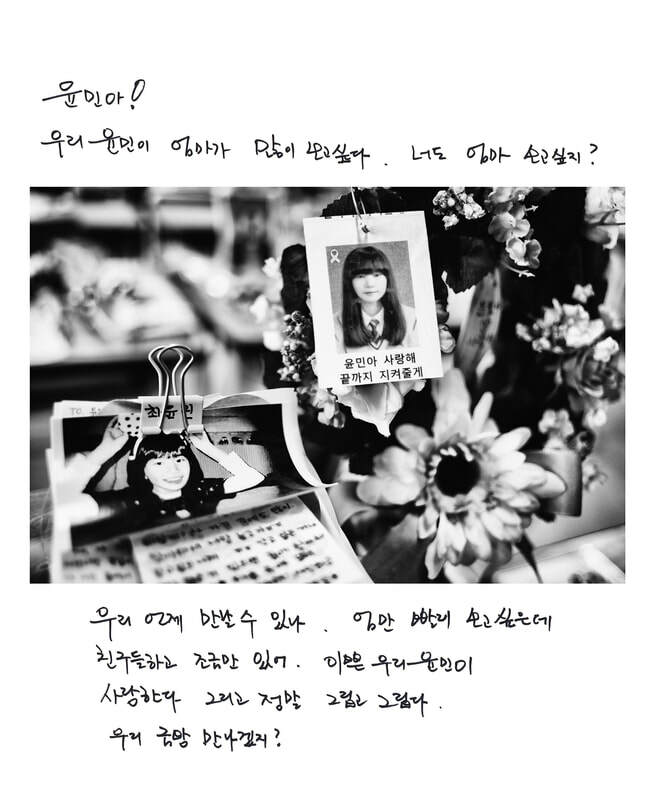 Kim Jeong-hee writes to her daughter, Kim So-jung. Her school jacket hangs on the back of her chair in classroom 2-2. I’m sorry you were born as my son and lived a short life. It was August 2016, on the 858th day that my sweet son came to me. 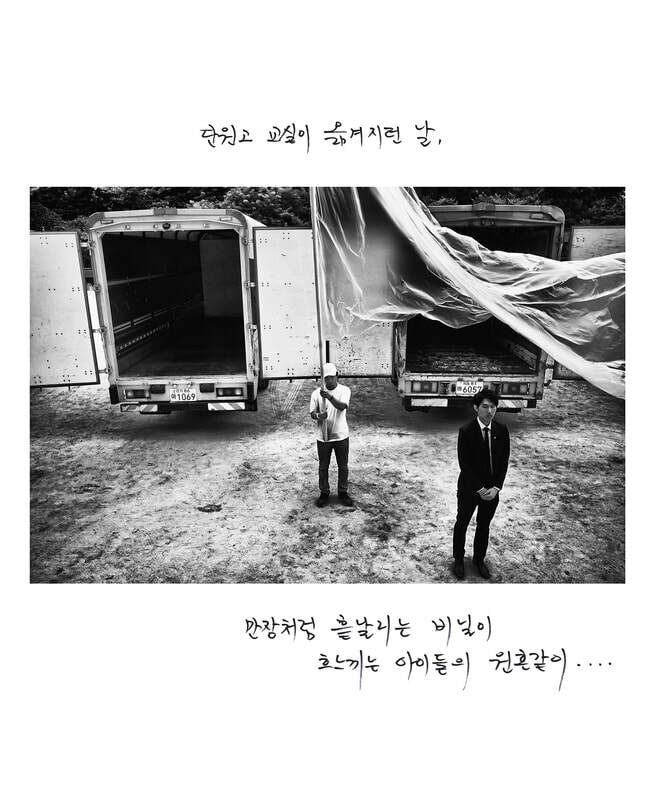 He spoke, asking me to try to save the Danwon classrooms one last time, but I couldn’t. Now as I look around the classrooms, I see things like the playground, soccer field, water fountain and jungle gym, places where you used to play and I feel like I failed to protect your dreams and hopes. I believe that the cherry blossoms in the school garden will remember my cherished son. I can still see you and your friends talking and laughing there from a distance. I’m sorry for you and hope you and your friends are doing well in heaven. I was happy with you. But I feel like I turned out to be a shameful mom. I think you would have grown up so well! I promise you I won’t give up searching for the cause of the wrongful deaths. Don’t forget, I’m always with you until the day we meet again. I love you my one and only son! 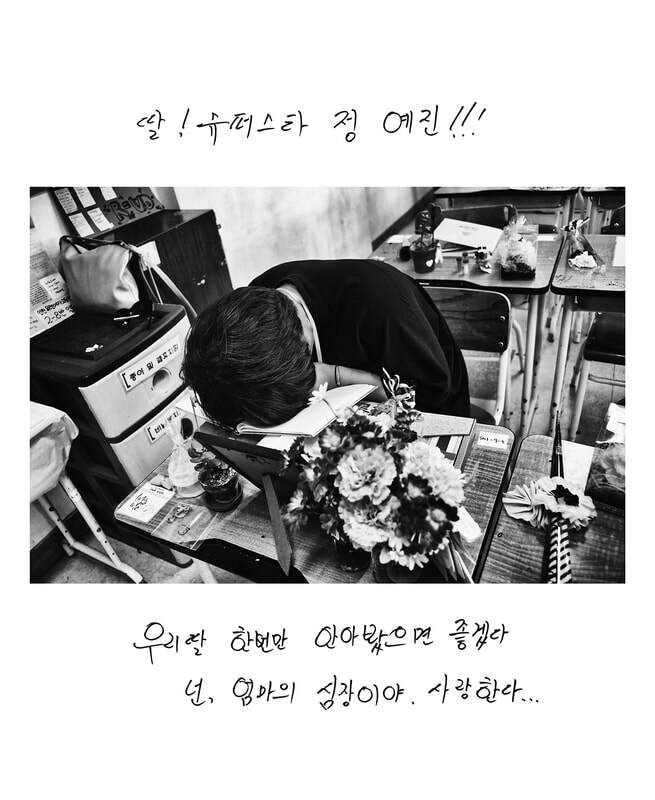 Kwon Mi-hwa writes a letter to her son, Oh Young-seok, in classroom 2-7. When you left, you said you’d be back home on Friday, Jung-seul! I’m aching and aching to see you. I didn’t even have a chance to say I loved you. When will we see you? You are in our whole family’s heart. Please wait until we meet again. I love you, Jung-seul! Jun Mi-soon remembers her granddaughter, Park Jung-seul, at her desk in classroom 2-10. Visiting the memorial classrooms before their official removal, families used the time to write to their children or pack up personal belongings. I miss you so bad, my sweet one. You miss me too, right? I’m wondering when we'll be able to see each other again. I want to see you so much. Please wait for me there with your dear friends. My precious, Yun-min. I love you and I’m dying to see you. I believe we can meet each other soon, yes? Park Hea-young recalls her daughter, Choi Yun-min. Prior to the trip, Yun-min painted her toenails pink with white flowers. ​It was one of the ways the family was able to identify her body, found 8 days after the sinking. I miss you terribly. I try to believe that you are still away on your school field trip. How I wish you would quickly come back home. Then I would be happy. I love you, my daughter! 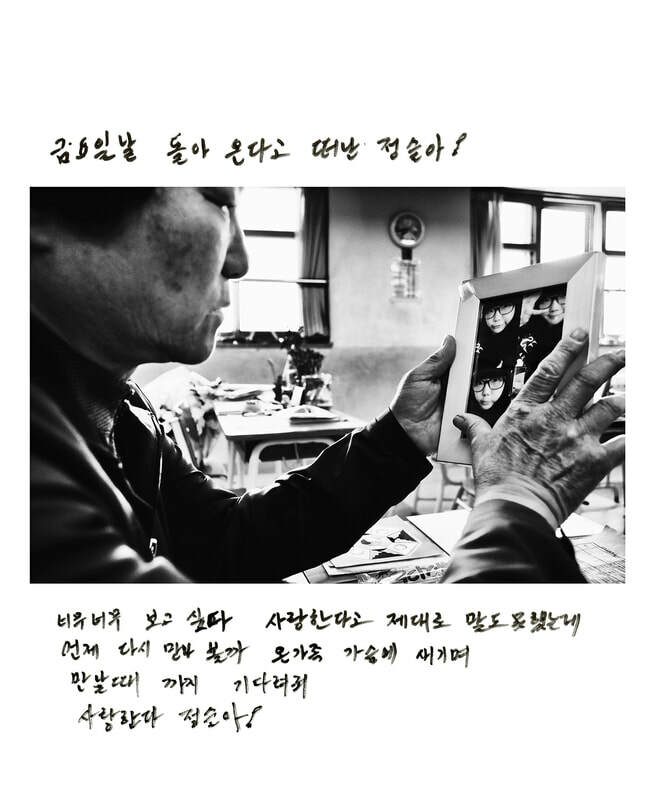 In classroom 2-3, Choi Sung-yong looks over letters addressed to his daughter, Choi Yun-min. 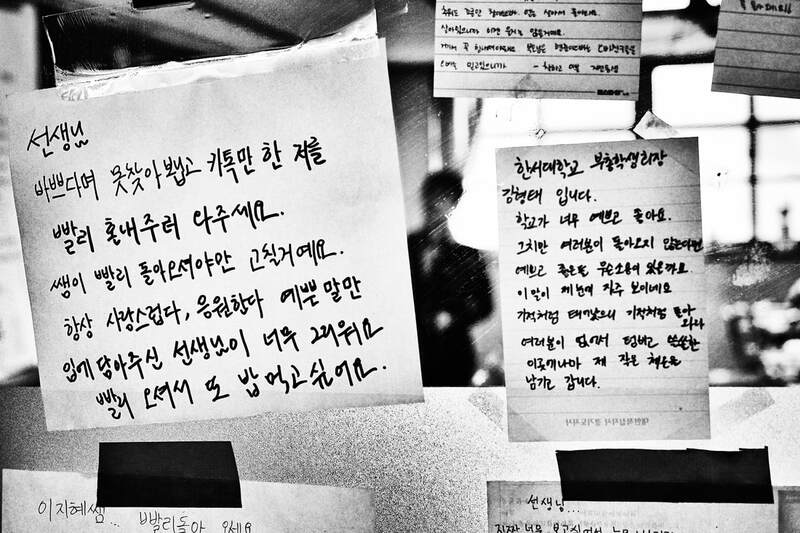 Part of a letter posted on one of the classroom windows reads: “Dear Teacher, I always made excuses not to visit you and instead took the easy way of phone messaging you. So you must come back quickly and punish this lazy student of yours. You are a wonderful teacher and I miss you very much. Please come back." Please come back in some way. Return to me as a star, the wind, or even sunshine…! ​his life jacket to a scared friend. ​The friend survived but he did not. 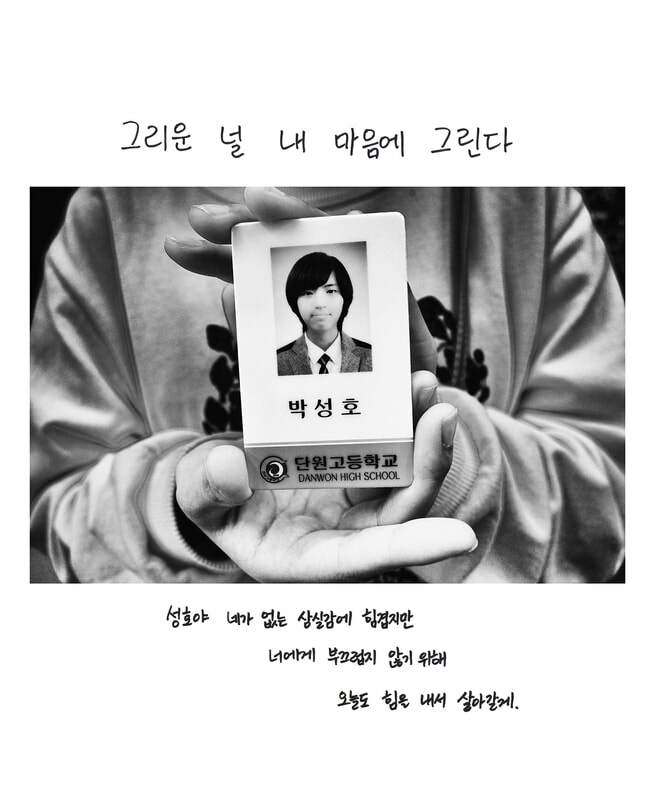 Cha-woong died a day before his 17th birthday. 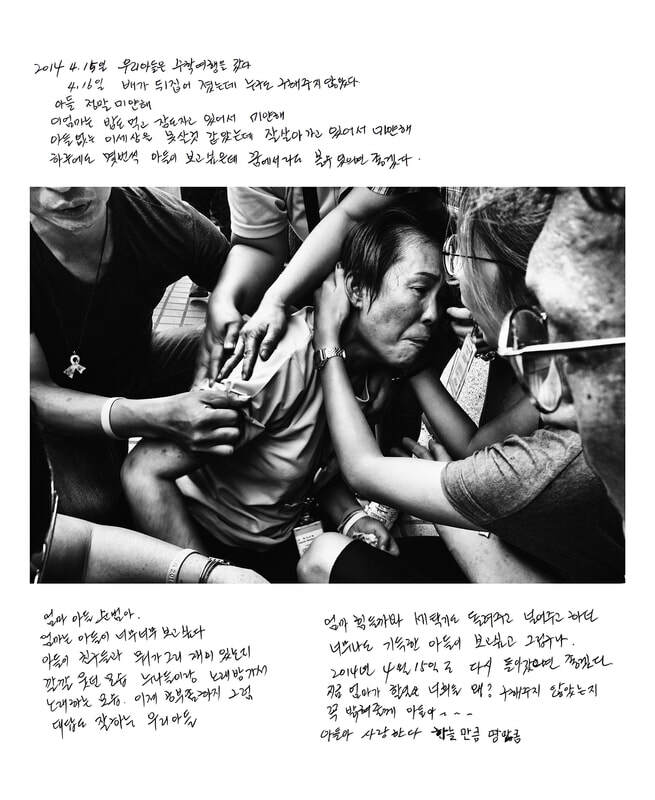 Park Yu-shin buries her head into Jeong Yea-jin’s memorial journal. 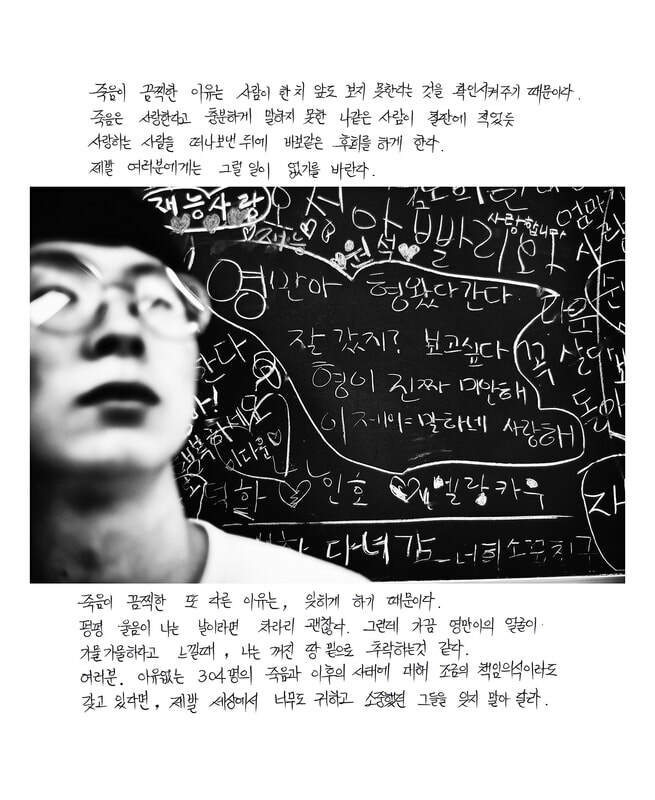 Jin-lee's life felt even more tragic since all that we really knew of him was his name. It was painful for me because I remember those school children with the belief that just one life is more precious than the heavens... And it hurts me even more to think of his parents suffering in silence. I believe remembering him is my duty and a road we must travel together. ​​​family members were tasked with the removal of memorial items from Danwon High School. On April 15, 2014, my son went on a school field trip. On April 16, the ship he was on sank but nobody saved him. I’m sorry, my son. I’m sincerely sorry that I still eat and sleep. I’m sorry I’m continuing to go on even though I feel I can’t. Many times each day I wish I could see my son. It would be so nice to see you, even if it was only in my dreams. My son, Soon-bum! I miss you so bad. I miss your laughter with your friends, despite not knowing what was so funny. Or the way you looked singing Karaoke with your sisters. And I remember how nicely you’d answer whenever I’d tell you it was time to study. You would always help me do the laundry and showed your love with actions. My special son, I want to see you and I miss you. How I wish I could go back to April 15, 2014. Why didn’t they save you all? My goal now is to find out~~~ My love for you is as endless as the sky and as big as the Earth. 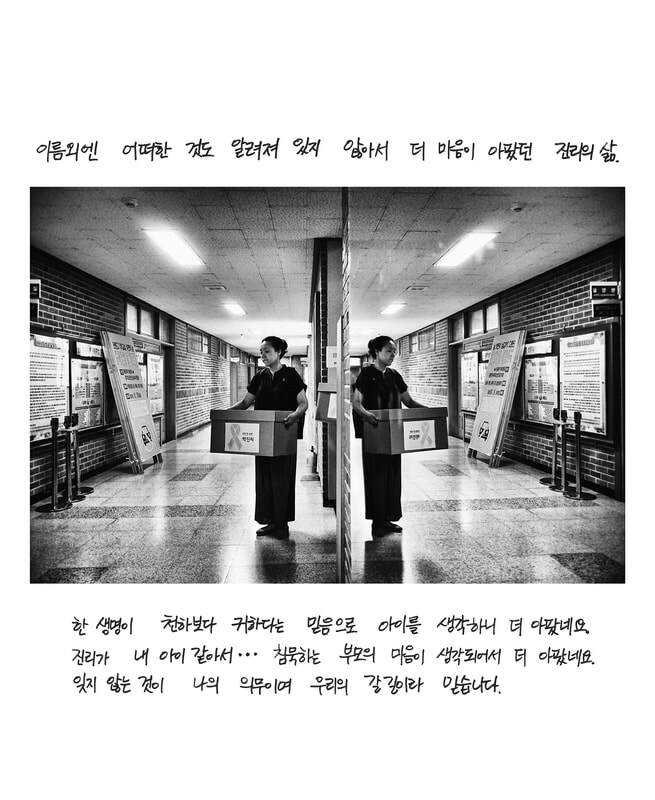 ​Danwon High School protesting the removal of classroom memorial items. ​a total of ​six vans were used to remove the majority of memorial items off campus. Chang-hyun!~~~ You are watching over Mom, aren’t you? Mom misses you so much! There are so many things I’d like to tell you… Let’s catch up in my dreams tonight. 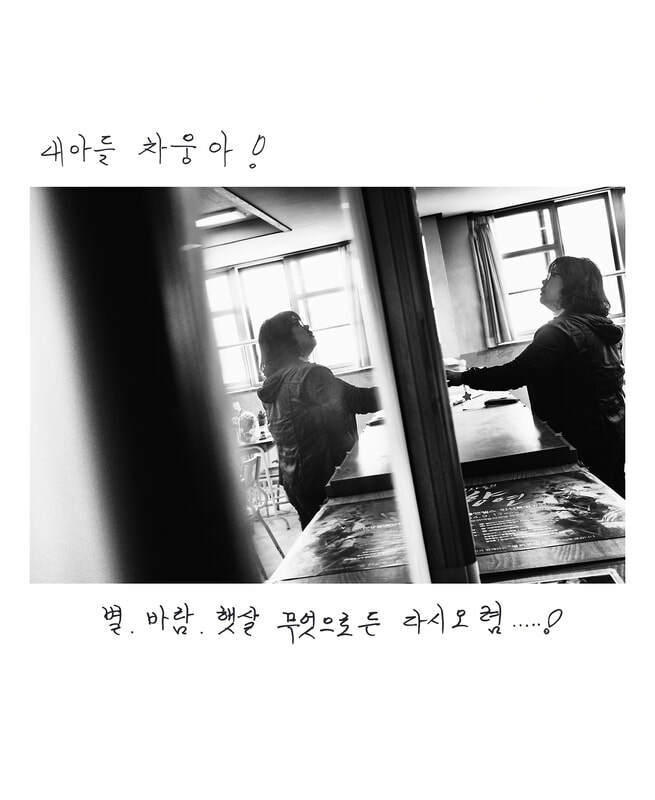 Choi Soon-hwa looks down from her son Lee Chang-hyun's boxed up classroom. She contemplates jumping from the ​3rd story windows as a means to stop Moving Day, which has just begun. 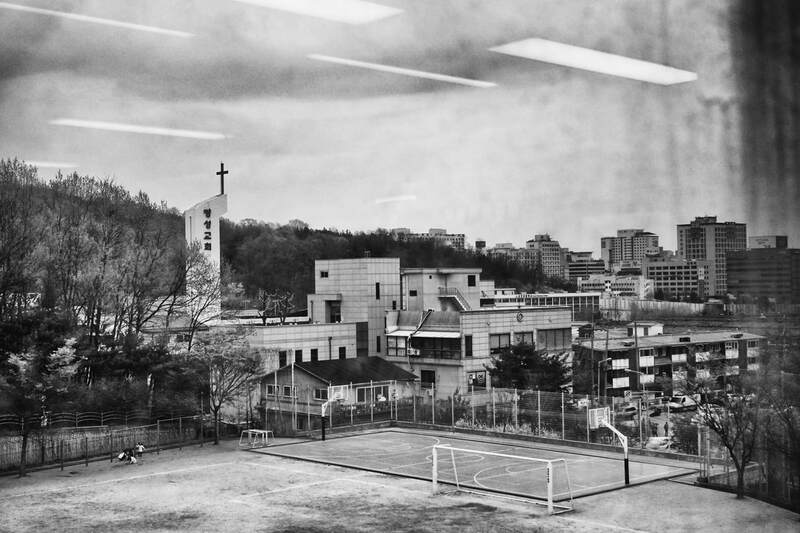 A view of Danwon from a classroom window.